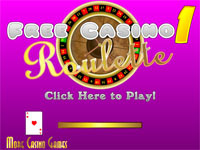 Roulette Casino is a freeware online casino style Roulette game. 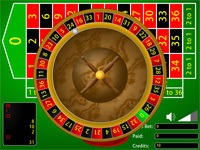 Play Roulette for free online at Casino Games & Slots. 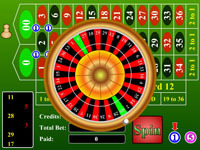 To play Roulette Casino you may click on any of the numbers on the game board, or you may choose an outside bet such as red or black, even or odd, 1st, 2nd, 3rd 12. You may also make split bets, line bets, square bets, or street bets. Betting on an individual number pays 36 to 1. Split bets pays 18 to 1, except bets split with 0 or 00. Split bets with 0 or 00 pay 12 to 1. Street bets 12 to 1. Line bets 6 to 1. Square bets 9 to 1. 1st 12 bet pays 3 to 1. 2nd 12 bet pays 3 to 1. 3rd 12 bet pays 3 to 1. 1 to 18 bets 2 to 1. 19 to 36 bets 2 to 1. Even bets 2 to 1. Odd bets 2 to 1. Red bets 2 to 1. Black bets 2 to 1. Split Bets - A bet can be split between 2 numbers by placing a chip between two numbers. Street Bet - A bet can be placed on a column of 3 numbers by placing the chip on the lower end of the table. Line Bet - A bet can be placed on any number touching a vertical line by placing a chip on the vertical line on the upper end of the table. Square Bet - A bet can be placed on four numbers at once by placing a chip at the intersection of a horizontal and vertical line on the table. 1st 12 Bet - A bet can be placed on 1-12 by placing a chip on the "1st 12" outside bet position. 2nd 12 Bet - A bet can be placed on 13-24 by placing a chip on the "2nd 12" outside bet position. 3rd 12 Bet - A bet can be placed on 25-36 by placing a chip on the "3rd 12" outside bet position. 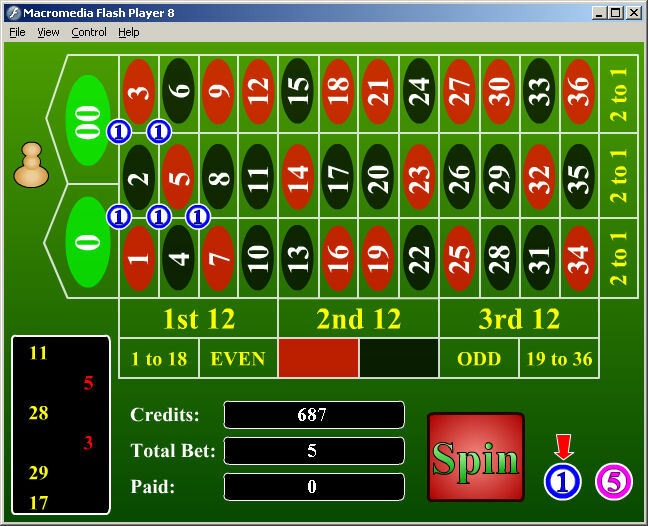 2 to 1 Bet - A bet can be placed on an entire row of the table by placing a chip on one of the three "2 to 1" positions.